Blueair 503, $659, is a 2009 upgrade from the older 501 model. Blueair air purifiers is an established premium air purifier builder, with deep market penetration for a premium brand, and decent product support. 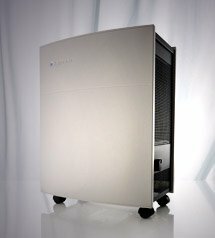 Blueair's stylish but conservative design, quality stainless steel construction, engineering focus, and high sound-to-cleaning ratios have built a good reputation. Designing an air cleaner involves tradeoffs. Premium true-HEPA systems must restrict airflow, and seal filters tightly, to insure efficient particle capture. Tight sealing and strong fans create high internal pressures which raise costs and create noise. Lower priced air purifiers generally allow some form of bypassing, air that leaks past filters - to ensure cooling airflow to vulnerable (i.e. cheap) motors. While the Blueair design has not completely avoided bypassing, it has produced a "loose" freely flowing air cleaner which is powerful, quiet, and efficient. The genius of Blueairs is hybrid polypropylene electrostatic filters that reduce resistance while producing HEPA level particle capture efficiency. This lowers energy use and noise levels, and produces high scores on CADR tests, widely used to measure and market air cleaners. Blueair 503 is focused on particle removal, and is less well suited to chemical/odor situations. There are no electronic sensors or automatic settings on the Blueair 503. (550e, the automated version of 503, is discontinued, for digital automation see 650e or 450e). The 503 has "4 Speed Control Options." 500 series Blueairs have the fan located at the bottom, blowing up through 1 top and 2 side exhaust ports, each with its own filter. Blueair 503 lacks a prefilter to capture large dust particles. This raises CADR rates, but allows fine dust inside the air cleaner, and means the main filters must collect all particle sizes. A separate washable prefilter to capture large dust particles would extend main filter life - recommended after only 6 months. The weakness of Blueair's ingenious design is the frequent filter replacements. Also, dust will build-up inside the 503. 503's fan cage and fan will eventually be coated in dust, which cannot easily be cleaned. Users should vacuum the entire unit, both inside and out, at each filter change. Dust builds up in the intake grill's round holes, eventually partially blocking the air intakes. A few Blueair 503 user reviews say vacuuming the coarse dust off the filter, (it visibly accumulates on the filter's front edge), will extend filter life. One review, by a guy claiming to be an engineer, suggests adding polyurethane foam prefilters at the lower air intakes to extend filter life. I do these "prefilter experiments" routinely on other air cleaners, but have not tried any on Blueairs as yet - use this idea at your own risk until more feedback accumulates. Of course, modifications like this are only for those who do not plan to buy filters to remain in warranty. Warranty will not cover modifications. Like the Blueair 501 before it, 503 is a strong performer on Association of Home Appliance Manufacturers (AHAM) Clean Air Delivery Rate (CADR) ratings. AHAM gives the 503 a recommended room size of 580 ft2. Blueair says the 503 can deliver 5 air changes per hour (ACH) in the AHAM 580 ft2 room. This is on high speed, 6 ACH would be better. Despite the stellar CADR performance, I recommend the Blueair 503 for rooms to 400 ft2, especially where heavier pollutant loads exist. Note that CADR ratings have no application to odors and chemicals. Buyers with these issues may need Blueair's more expensive optional SmokeStop filters, which raise costs enough to make the IQAir or other premium chemical air cleaner a viable alternative. Many consumers believe "HEPA" means folded paper filter elements. In reality, HEPA is a filtration efficiency standard, rather than a type of filter. So "HEPASilent" means the 503s have filters which are able to arrest 99.97% of extremely small 0.1 micron particles. The Blueair filter design uses 3 layers of electrostatic progressive 1-piece filters with three layers. The spaces between polypropylene fibers get narrower from front to rear. Particles are negatively charged by a set of ionic brushes, then different sizes penetrate varying distances into the 503's filters. Unlike other electrostatics, the charging process creates no ozone. Typical electrostatic air cleaners loose efficiency as tiny particles cover and insulate collector grid surfaces. Blueairs' HEPA-like layered filter avoids this trap, retaining efficiency without the constant grid-cleaning the previous generation electrostatic machines needed. I expect there is still some efficiency loss as filters age and load, and to retain warranty coverage, Blueair requires owners to replace filters, 3 for $80, at six month intervals. 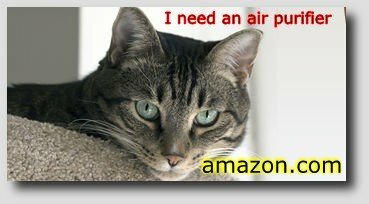 Smoking and pet households will likely need additional replacement filters. Blueair 503's 3 filters are easily replaced, about like putting books on a shelf. Older Blueair 500-600 series filters had no activated carbon, but the 2009 upgrade added a black activated carbon layer to the standard filters. These filters are designed to have the carbon side facing the outside, so airflow goes through the particle filters first. The optional SmokeStop filter set is $150, and has additional gas/odor adsorbent materials. Blueair 503 buyers should be aware that knock-off or older Blueair filters may be for sale - these are not guaranteed to perform well. Blueairs have a very competitive noise-to-cleaning ratio, but some users dislike a whistling frequency in the sound pattern. At top speed 71 dB(A) will be very loud, but at 450 cfm, most high speed operation should be brief. Speeds 2 and 4, where most folks will run the 503, look very good from a noise-to-performance standpoint. Blueair 503's low voltage negative ionization brushes do not create ozone. 503 has a powder coated finish over steel, there is no out gassing. Some user reviewers report a "new car smell" which dissipated after a few days, but this is rare. Blueair 503 just hasta have a bright blue LED light, which many users tape over for better sleep. Why do so many air purifier makers insist on these too-bright nightlights? Blueair 503 is Energy Star® rated. Power consumed is 120 watts - 35 watts, depending on fan speed selected. Blueair makes much of their Swedish styling awards, but I think the 503 is a little square looking. This is a good thing, the company's engineering conservatism keeps filters and parts available. In contrast, Sharp Electronics, while building leading-edge air purifiers, has pursued a planned obsolescence strategy, moving rapidly to new designs and leaving buyers of prior models with weak support. Blueair 503 weighs 35 pounds, and is mounted on casters. Smaller or older users may have problems moving it up stairs. Blueair has been based in Stockholm, Sweden since 1996. Blueairs are distributed in North America from Chicago. Like other builders, Blueair has been forced to reduce warranty claims during the "temporary recession." Warranty is now 1 year, but owners MUST buy filters on time at 6 month intervals, and be ready with proof-of-purchases, for all warranty claims. Blueair offers a Filter Subscription Program that provides new filters every 6 months to avoid overloading and extend warranty coverage to five years. Blueair's 503 is a perennial contender in the premium class. Filters are expensive and must be replaced to retain performance. Particle focused, the Blueairs are not really for the chemical sensitive, the optional SmokeStop filters are expensive, restrict airflow, and are combined so that carbon cannot be replaced separately. Blueair 503 is an excellent performer for particle related allergies.